Rome was free! The 36th drove through the city and headed northward as enemy rear guards fell back to hastily prepared positions. Early on the morning of June 5, the 142nd Infantry was fired upon at a turn in the road five miles outside the Italian capital. 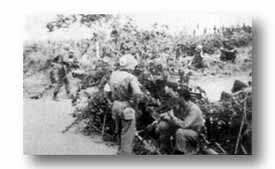 The enemy delaying force, with several anti-tank weapons and supported by strong mortar and artillery fires, presented a formidable obstacle. The Germans quickly forced a struggle. 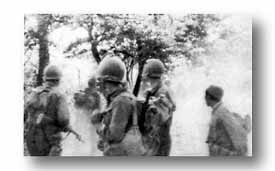 The 3rd Battalion was brought up hurriedly from the rear and deployed for the attack. Companies K and L, with I and M laying down a base of fire, fought until late afternoon before the block was wiped out. Immediately following, the 141st and 143rd, along with elements of the 1st Armored Division, passed through the 142nd to follow up the rout. Through the Lake Bracciano-Manziana sector, the Division plodded on, coping with sporadic resistance as Germans vainly attempted to delay our troops. Swinging west toward the coast, the "Texas" Division mopped up German remnants in its path to Civitaveechia, important Italian port which had fallen the same day to the 34th Division. Continuing north to Tarquinia, the 361st Infantry, attached to the 36th, met and overcame bitter German opposition. 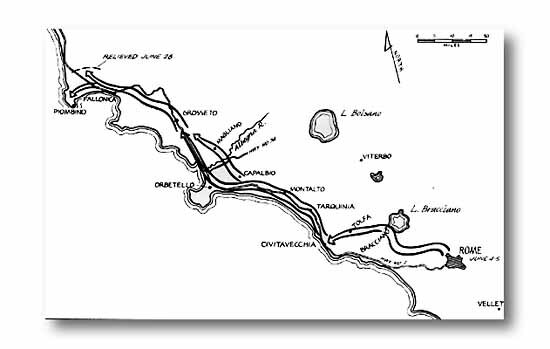 By June 12 the 142nd and 143rd had established a bridgehead over the Albegna River before Grosseto, following hard fighting that had centered around the hills overlooking Magliano. Three days later the large town of Grosseto fell. At a turn in the road just outside Rome the Germans hastily set up this block with many A-T guns. A day-long battle wiped it out. The prisoner toll mounted again and dust became thicker. Germans also slaughtered thousands of horses.